Opening Friday, April 3 (6:30–8:30 p.m.) and continuing through June 1, Chord and Color, an exhibition of paintings and sculpture by Jim Zingarelli, will take place at the Robert Lehman Art Center at The Brooks School in North Andover, Massachusetts.The exhibit also features original scores based on the Chord & Color paintings and performed by saxophonist Gail McArthur-Browne and violinist Helen Sherrah-Davies, professors of music at Berklee College of Music in Boston. 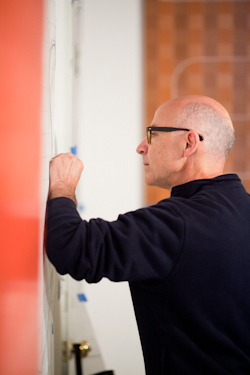 Zingarelli is a professor of art at Gordon, where he has taught since 1996. His primary work as an artist and teacher is oriented toward abstraction and contemporary art with an emphasis on interdisciplinary study within the fine arts. His most recent work collaborates with jazz musicians involving issues of tempo, chord structure, and color. His work has been exhibited at venues including Dartmouth College; Yale University; Vorpal Gallery in New York City; St. Paul’s Cathedral, Boston; and the Attleboro (MA) Arts Museum. Image: Jim Zingarelli, Chord & Color #4, oil, alkyd, and graphite on linen, 16″ x 42″, 2015.